Q: According to reports, US Secretary of State Rex Tillerson said that the US is ready to have ameeting with the DPRK without preconditions. What’s your comment on this? A: We have noted this remark by Secretary of State Rex Tillerson. 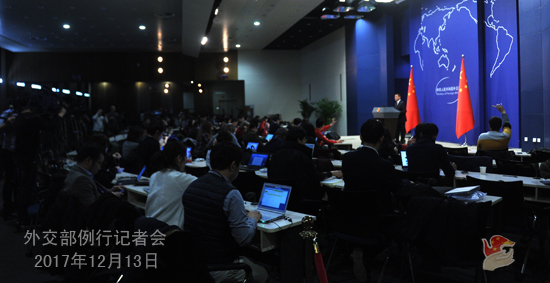 Peaceful settlement of the Korean Peninsula nuclear issue through dialogue and negotiation remains the consistent position of the Chinese government. 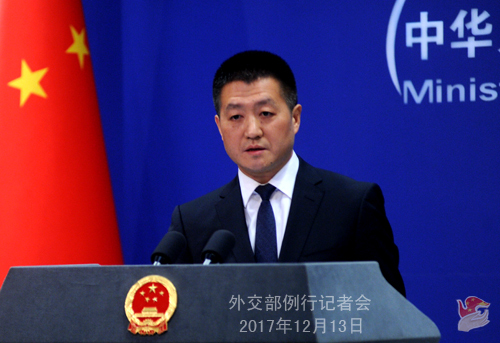 China welcomes all efforts that will help ease the tension and resolve the issue through dialogue. To this end, China has put forward the dual-track approach and “suspension for suspension” proposal. We hope that the US and the DPRK will work towards the shared goal and make a meaningful step towards dialogue and engagement. 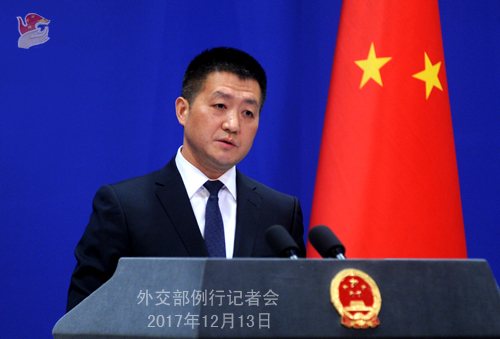 China stands ready to continue to play a positive role in promoting the proper settlement of the relevant issue of the Korean Peninsula through peaceful means. Q: According to reports, Secretary of State Rex Tillerson also talked about the response to a potential exodus of refugees from the DPRK and measures to ensure the security of nuclear weapons. Can you confirm that? A: I have no idea about what was referred to by the US side, but I would like to reiterate that China’s position on the Korean Peninsula nuclear issue remains unequivocal. We stay committed to the goal of denuclearization of the Korean Peninsula, upholding peace and stability of the Peninsula and resolving the relevant issue through dialogue and negotiation. We believe that settling the Korean Peninsula nuclear issue through dialogue and negotiation represents the consensus of the international community and best serves the common interests of various parties. We hope that the US and the DPRK will engage in direct dialogue to accumulate mutual trust so as to create necessary conditions for settlement of the Korean Peninsula nuclear issue through dialogue and negotiation at the end. Q: Did the arrangement of the state memorial ceremony of the National Memorial Day for Nanjing Massacre Victims today took consideration of the relations between China and Japan? A: The state memorial ceremony of the National Memorial Day for Nanjing Massacre Victims was broadcast live by Chinese media today. President Xi Jinping and other Chinese national leaders attended the state memorial ceremony, and Chairperson of the Chinese People's Political Consultative Conference (CPPCC) Yu Zhengsheng gave an important address. The ceremony has sent out the key message of bearing history in mind, honoring all those who laid down their lives, cherishing peace and opening up the future. In terms of China-Japan relations, Chairperson Yu Zhengsheng’s speech today has made clear China’s position that only by taking history as a mirror can we guide the future of China-Japan relations. Q: Yesterday, you made remarks on Russian President Vladimir Putin's announcement of the withdrawal of troops from Syria. Do you have additional comments on the cooperation between China and Russia on the Syrian issue? A: As I said yesterday, over the past two years, the counter-terrorism operations in Syria have made important headway thanks to the great effort made by Russia, and China made positive appraisal of this. We maintain that the international community should continue with its coordination and cooperation on firmly combating all forms of terrorism, and advancing the process of political settlement of the Syrian issue under the auspices of the United Nations. As for the cooperation between China and Russia as you mentioned, the China-Russia Comprehensive Strategic Partnership of Coordination has been operating at a high level, and the China-Russia relationship has become an important cornerstone for upholding world peace and tranquility and championing win-win cooperation. The two sides also maintain close communication, coordination and cooperation on major international and regional issues. We stand ready to work with Russia and other relevant parties to move forward the political settlement process of the Syrian issue. Q: According to reports, yesterday US Secretary of State Tillerson specifically said that the US has talked to China about the need to secure the DPRK’s nuclear weapons in the event of a collapsed state or some huge upheaval. The US troops would go into the DPRK to secure these weapons with the pledge to retreat to the ROK after securing these weapons. What is China’s position on this? How did China respond to what Mr. Tillerson said? Does China believe his pledge that the US troops would indeed go back into the ROK and not remain in the DPRK? A: Regarding the Korean Peninsula nuclear issue, while keeping firmly in mind the goal of denuclearization of the Korean Peninsula, we always stay committed to upholding peace and stability of the Peninsula and resolving the Korean Peninsula nuclear issue through dialogue and negotiation. It is based on this consistent position that we have been explicitly emphasizing in our communication and coordination with various parties that no war or conflict is allowed on the Korean Peninsula. This position is very clear. As to the specifics of Secretary of State Tillerson’s remarks you just mentioned, I wonder whether you remember that the US reaffirmed their “Four Nos” promise several times, namely, not seeking a regime change, not seeking a collapse of the regime, not seeking an accelerated reunification of the peninsula and not seeking an excuse to send the US military north of the 38th Parallel. Q: According to reports, on December 12 local time, the first Chinese-American Mayor of San Francisco Edwin Mah Lee died of heart attack. How do you evaluate him? A: Mr. Edwin Mah Lee is the first Chinese-American Mayor of San Francisco. During his tenure of office, Mr. Edwin Mah Lee has been dedicated to developing relations with China and made positive contributions to the economic, trade, cultural and people-to-people and other exchanges and cooperation between San Francisco and China. We express our deep mourning for the passing of Mr. Edwin Mah Lee and convey sincere condolences to his family and the people of San Francisco. Q: You fielded a question about US basketball player Rodman who wishes to organize a basketball game in Beijing between the DPRK and Guam. Do you have more comments? A: I haven’t got any information though I did try yesterday. Can you provide more details you have at hand? We are not aware of the relevant information given that it may be an ordinary commercial sports activity. Q: According to reports, the Human Rights Watch today issued a report expressing concern about the Chinese government’s moves in Xinjiang to obtain DNA from every single resident. What’s your response to this? A: This organization you mentioned has kept making false allegations on China-related issues all along. That’s why I would like to say that such allegation is not even worth your time. In terms of the situation in Xijiang, we have said from this podium many times that with economic development, people in Xinjiang are living a peaceful and happy life, and the situation there is sound. Indeed, certain people overseas may be unwilling to see such a situation. I would like to tell them that the Chinese government will continue to uphold the unity of people of all ethnic groups in Xinjiang, safeguard their happy life and promote progress in various fields of Xinjiang. Q: According to reports, ROK President Moon Jae-in started his visit to China today and he will meet with President Xi Jinping. What expectation does China have for the settlement of the THAAD and the Korean Peninsula issue? A: We have released the information about President Moon Jae-in’s visit to China. I have noted that he gave an interview to media ahead of his visit and the ROK government also briefed on the considerations concerning this visit. A comparison of the information released by China and the ROK will testifies to the fact that the two sides share many common aspirations, that is to say, both sides are willing to strengthen mutual trust and promote the greater development of China-ROK relations in various fields on the basis of mutual respect through President Moon Jae-in’s state visit upon President Xi Jinping’s invitation. The two state leaders will exchange in-depth views on bilateral relations. Besides, they will indeed discuss international and regional issues of mutual concern, and I’m not getting ahead of how the discussion will be held. We will let you know in due course. Due to scheduling reasons, the regular press conference of the Foreign Ministry on December 14 (Thursday) will be held at 2:30 p.m. at the same venue.